The decision to buy may be long (a home, a car, travel) or short (tonight’s dinner, a new top), but has the same steps. From awareness to advocacy, you know that your customers learn of your brand, research or engage with it, and decide to buy or not to buy through your website. Watch entry and exit points. Watch what’s happening carefully. Does traffic enter your site on your home page every time? Do they all take the same path through your content to the point of purchase? If they do, you have an extremely linear experience—which is rare (if not unheard of). Sites should have enough content to educate and inform, but also a clear call to action. Where your visitors exit can also be telling. Do they “get lost” within a particular area of your site, and leave before taking action? What steps can be taken to prevent this from happening, and shorten the number of clicks from the first to the last page? If the average of pages viewed per visit is three or more, the path to conversion may be too long. For instance: if your doctor’s office site has been created to generate new patients, those brand new patients might want to explore the credentials of the staff, the treatment types they offer, and whether or not the office is accepting new patients. All of these pieces of content could be contained on the home page. A click to call feature or click to see available appointments would provide instant gratification for any new patient. This orthopedic specialist has a popup click to make an appointment. It isn’t intrusive, but it allows for new patients to immediately connect. If your site is intended to simplify a purchase, the faster you can close a transaction the better. 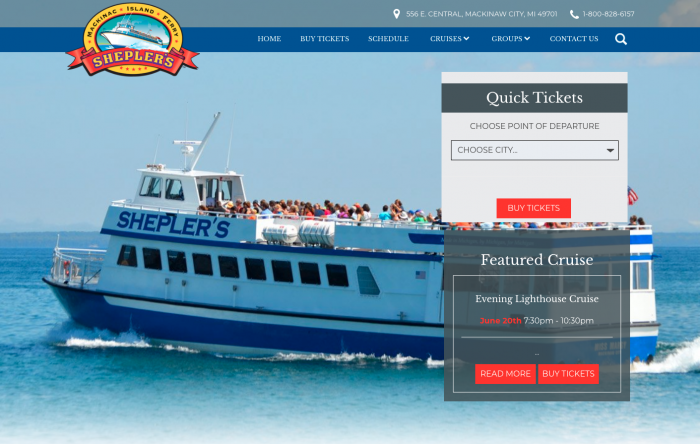 Take Sheplers’ Mackinac Island Ferry, for instance. This site was built to change the Shepler’s model from a labor intensive, manual purchase through an in-person ticket window to a seamless, online experience using a mobile device. The customer should be able to complete their transaction in less than 3 minutes. Returning customers, less than 2 minutes. Rather than 20 minutes in a ticket line, a 3-minute smartphone exchange is significantly better. But knowing that optimizations can be made over time by carefully monitoring the areas of the transaction that take the most time can further decrease friction in the purchase process. Like a magician that invites you to “pick a card,” you should know what selections your viewers will choose most frequently. Pieces of content that introduce a new program or product, or offer a “featured” feel will likely draw more attention than a blog posted 10 months ago. The more prominent the placement, the more relevant it should be to the user. Think about both frequency and recency. How often does your client transact on your site? If monthly, perhaps you change content features once each month. More frequently? Match the frequency and recency of your average (not the most valuable) client, and you’ll capture their attention with the content you provide. 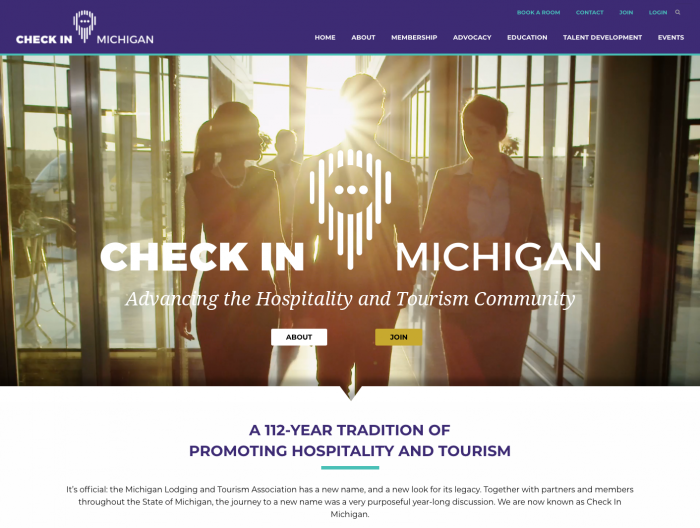 The Check In Michigan home page features the nearest upcoming events, and the most recent news and industry updates. Both are dynamic, keeping up to date without manual maintenance needed. A certain percentage of your traffic will know and visit you because they are already aligned with your brand. While it’s important to maintain a current customer, it’s also important to foster new business. Is your search budget generating a healthy percentage of your site traffic? How about display? Measuring how your customers are reaching you, and then taking steps to amplify or modify that traffic purposefully is among the best ways to use your knowledge of site traffic to benefit your business. Where your traffic originates as well as the age or characteristics of your traffic can tell you so much. Knowing that your average site visitor is 50 means the messages that will influence him or her should be very different. Perhaps you are looking to diversify the age ranges of the clientele your serve. Measuring the mix of these individuals will help you identify when your marketing activities are successful. Regardless of the goal, understanding who is on your site, how they convert, and what they consume while in your digital footprint will make tomorrow’s marketing activities smarter than today’s. Consider analytics as the foundation of a marketing strategy, rather than the way to measure it, and you’ll be more successful at launch.